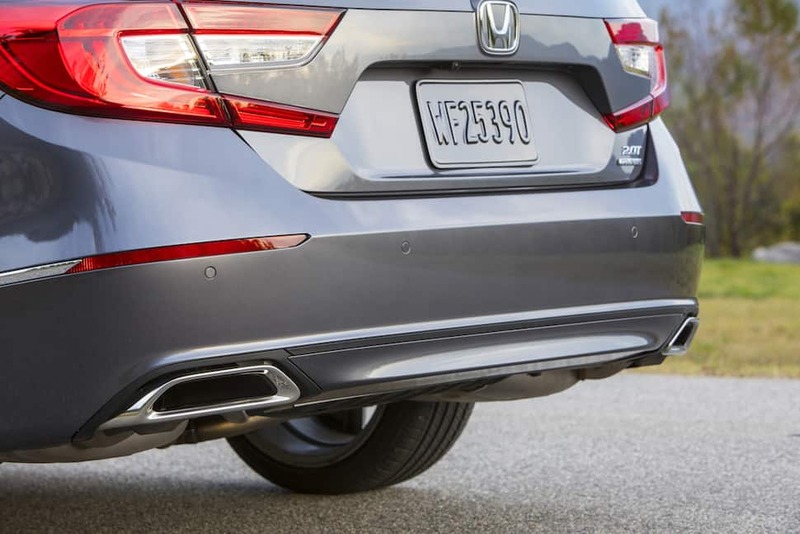 For 2018, Honda gave its Accord family sedan what we’d argue was the most dramatic redesign in this well-known model’s history, shrouding a new platform and drivetrains in some of the segment’s most distinctive styling. That redesign came with a pair of new turbocharged engines, one a 1.5L four-cylinder shared with the Civic compact and CR-V crossover, the other a 2.0L borrowed from the RDX crossover sold by Honda’s upscale Acura brand. The 2.0L turbo engine is Honda’s follow-up to the delightful V6 that was the performance upgrade in past generations of this sedan, and which reached its peak in the mid-2000s when it was briefly offered with a manual transmission in the Accord four-door. A decade later, Honda is recalling the Accord’s wannabe-sport-sedan past for 2018 by offering this new 2.0L with a six-speed stick, as well as a new 10-speed automatic, which the company says is a first in a front-wheel drive car. Keen as we are to try the Accord’s 2.0L/manual transmission combo, we can’t argue with Honda’s decision to give us a test car with the automatic, a choice that most Accord buyers will make regardless of which engine they choose. If the automatic is your cup of tea, it’s a choice you likely won’t regret. The Accord’s 2.0L makes 252 hp and 273 lb-ft of torque, which is more than enough power to make it genuinely quick. The 10-speed contributes with closely-spaced gear ratios to keep the engine well within the 1,500-4,000 rpm envelope where it cranks out all that torque. No, the automatic’s performance won’t cause any buyer’s remorse, but its controls might: the 10-speed brings with it Honda’s push-button transmission controls, one of the few things we dislike about this car. It could just be stubbornness in the face of the unconventional, but the push-button arrangement is more difficult to use without having to look down at the centre console, particularly when you want to make a quick transition from drive to reverse in order to pull off a quick three-point turn or parallel park on a busy street. It’s almost — but not quite — enough to convince us to give up the 2.0L’s extra power in favour of the 1.5L Accord’s traditional shift lever (which, by the way, controls a continuously variable automatic whose operation is less satisfying than the 10-speed’s). Ultimately, we’re suckers for big power, especially in combination with a chassis as nicely sorted as the Accord’s. The Touring 2.0 trim’s adaptive suspension rewards aggressive steering inputs with quick responses, but it isn’t quite sport-sedan material: high-speed corners bring out the car’s predictable tendency toward understeer. The Accord’s cabin is less daring than those in the current Civic and CR-V. Instead of the all-digital gauge clusters in those cars, the Accord gets a traditional analog speedometer next to an LCD screen that can be set to show a virtual rev counter or your choice of eight or 10 screens’ worth of secondary information. Interior space is generous enough for four adults to enjoy lots of legroom, but if you want headroom up front you have to live with the Accord’s high window line, which made me feel a bit hemmed in unless I cranked up the driver’s seat height adjustment. The touchscreen atop the centre stack handles all things infotainment in the Accord, including smartphone integration for both Apple and Android devices. Our Touring tester came with embedded navigation, but you can forgo that in the Sport 2.0 model and still use your smartphone’s navigation function when it’s connected to the infotainment system. Also of note is that all Accord trims come standard with forward-collision warning and automatic emergency braking, automatic high beams, lane- and road-departure mitigation. Honda isn’t the only automaker that rolled out a redesigned family sedan in 2018. Toyota redid its Camry for 2018 and, as we write this, is already selling the 2019 version, whose similarly equipped XLE V6 comes in a little more expensive than the 2018 Accord 2.0L Touring we reviewed here, but boasts 301 hp and 267 lb-ft from its more traditional six-cylinder engine. The Nissan Altima is new for 2019 (our review here), and unique among family sedans for its standard AWD, but the only engine available in Canada is a modest four-cylinder making 188 hp. To us, the only other mid-size sedan that challenges the Accord for overall driving engagement is the Ford Fusion. Its European roots lend it great handling, and Ford’s own 2.0L turbo offers similarly sharp performance, while a Fusion Sport (reviewed here) gets class-leading 325 hp and 380 lb-ft from a turbo V6. The downside is a less spacious cabin than the Accord’s nearly full-size accommodations. And that leads us to a theme frequently explored in family sedan reviews lately: the fact that the segment could soon disappear, as crossovers take over the market for family-friendly vehicles. Ford’s response to that was to announce earlier this year a plan to eliminate all of its car models save for the Mustang and focus on developing its crossover range. However, this new Accord design — better than its predecessor in most respects — proves Honda isn’t ready to give up so easily on a car that has been key to the company’s success for more than 30 years. We’re glad it’s as good as it is, because pretty soon, if you want a family car that’s also entertaining to drive, the Accord will be your only choice.